A few years ago Leslie acquired some strange little plants which get their nourishment by eating insects. She purchased these from a vendor at a local plant show. I was skeptical about them at first until I noticed that the number of flying insects in our yard had decreased noticeably. The vendor is Don Elkins and he calls his company Mesa Exotics. Last weekend we visited his greenhouse in Arroyo Grande, near San Luis Obispo. While Don and Leslie talked exitedly about the care and feeding of these little meateaters, I amused myself by snapping a lot of pictures. Leslie was kind of like a kid in a candy shop. We returned with a car full of bits of unusual and unfamiliar vegetation, all of it designed to make an insect's life a short one. Outside, next to empty farmland, was a field of pitcher plants. These plants have a long tube into which unsuspecting insects are attracted by some sort of smell. Once inside, the little fly can't escape and it gets digested. How does that work exactly? I haven't a clue. Leslie refers to carnivorous plants as CPs. CPs come with a wide range of techniques for snaring their prey. Here are some examples beginning with a Pygmy Sundew. I thought the little droplets on this plant were actually water. I was informed that it is slime made by the plant. Somehow this attracts small insects. This plant is called a Butterwort. The leaves are very smooth to the touch because they're covered with tiny, slimy hairs which trap small insects. This particular plant has been dining well lately. The next two are from the genus Nepenthes. These produce colorful pitchers suspended on long elegant vines. The first picture shows a living pitcher, the second shows one which has died. This is an extreme closeup of the flower of a Bladderwort. The flower is very tiny. It's called the Angry Bunny. The most famous CP is the Venus Fly Trap. Don had a lot of them in his greenhouse but I didn't snap any decent pictures of them. Here's one of Leslie's plants which had captured a large scrumptious moth that couldn't get away quite fast enough. Leslie had clearly found a kindred spirit in meeting Don. They both have considerable enthusiasm and excitement for these curious species. We'd like to thank him profusely for sharing his time and expertise and passion for these little carnivores. Also, thanks for the cool plants. There's been a recent spate of news about Sheep-Eating Plants. 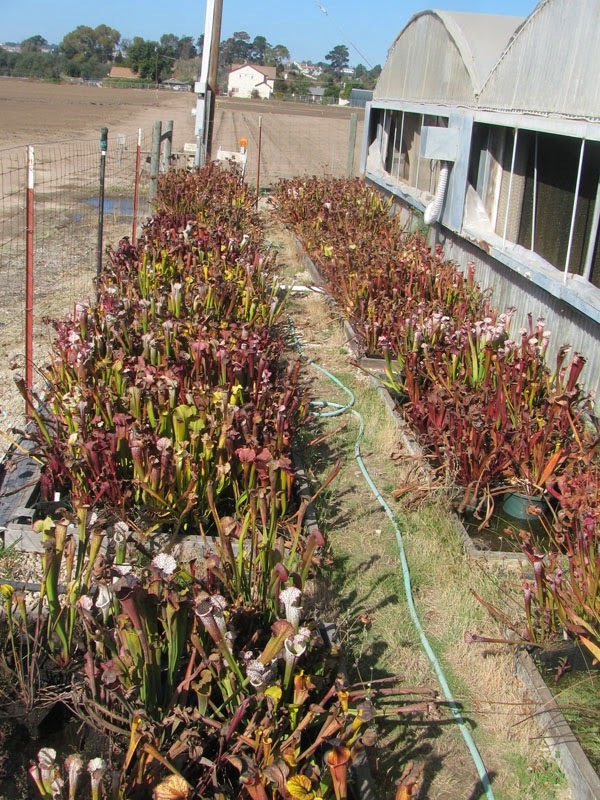 Here's an article which details these and other, even stranger, carnivorous plants.